Wow. Where has the time gone? Not that I need further reminders just how busy life gets come Autumn, but the fact that I haven't contributed to the blog since September does just that! Many apologies to my regular readers! Since the last posting I have been doing a lot of traveling. I've given concerts in California, Virginia, and North Dakota, and I had the opportunity to visit several nice local bars and taste some wonderful local brews. The highlights? Sipping beers at JL Beers in Grand Forks, North Dakota after a performance at the Digital Arts Festival, joining the Capital Ale House in Richmond, Virginia for their 10th anniversary party, and being introduced to Hardywood Park Craft Brewery (also in Richmond), from whom I got to enjoy their Singel: a lovely Belgian style pale beer with mild spice, pronounced biscuit flavors, and subtle hops. But the absolute highlight of the trip? 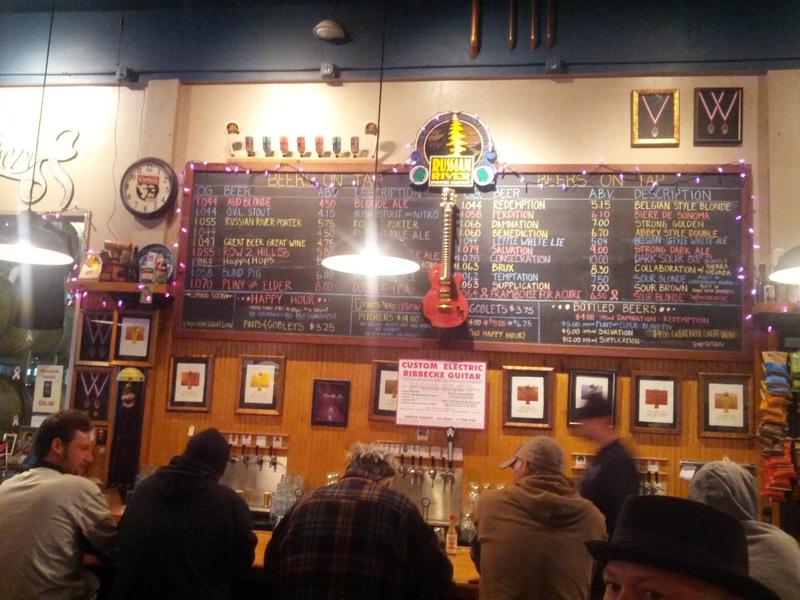 Visiting Russian River Brewing in Santa Rosa, California. For those who don't know, Russian River is one of the most famous breweries amongst beer lovers. Their Double IPA Pliny the Younger is widely considered one of the best beers in the world (current BeerAdvocate ratings have it listed at #1), and Pliny the Elder, another DIPA, is always in the top ten. Famous not only for their American IPAs, but also their Belgian style beers, their three sours – Supplication, Consecration, and Temptation – are regarded as the best American Wild Ales that can also stand toe-to-toe with the greatest of the international sours. Due to the fact that Russian River does not ship to Massachusetts, prior to my visit, I had a very limited history with Russian River. Several years ago, while living in Los Angeles, Lucky Baldwins Pub in Pasadena had a Russian River Tap Takeover. 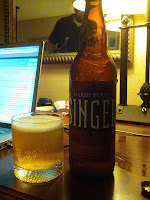 Though I had been familiar with their beer, this was my first personal introduction to their work. (As an aside: Pliny the Younger made an appearance at that event; according to the waiters that day, there was a line stretching around the block five hours before the bar opened! I got there right at opening, and when I asked for a pint of PtY, I only received raucous laughter...) I remember being blown away by everything I tasted, but I still had to wonder just how well they would live up to this tremendously high reputation. I arrived at the brewery around 4pm. 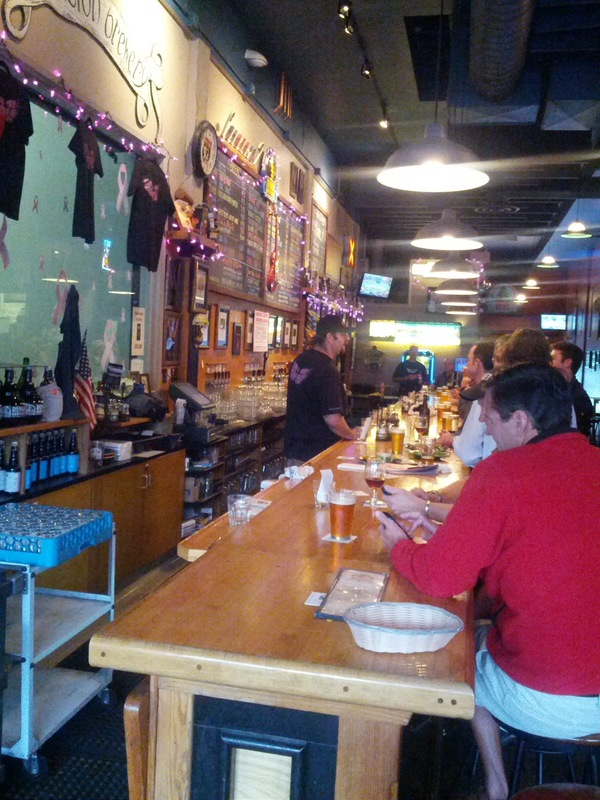 The brewpub is right in the middle of the downtown of Santa Rosa and from the outside is pretty unassuming. In fact, if I hadn't heard of the brewery previously, I very well may have driven right past. The restaurant is fairly large with a long bar and lots of seating. There were plenty of open seats when I arrived, though the bar filled up quite a bit not long after I arrived. I took a table with a friend (positioned right in front of a large HDTV broadcasting the baseball playoffs), and we ordered the tasting flight. 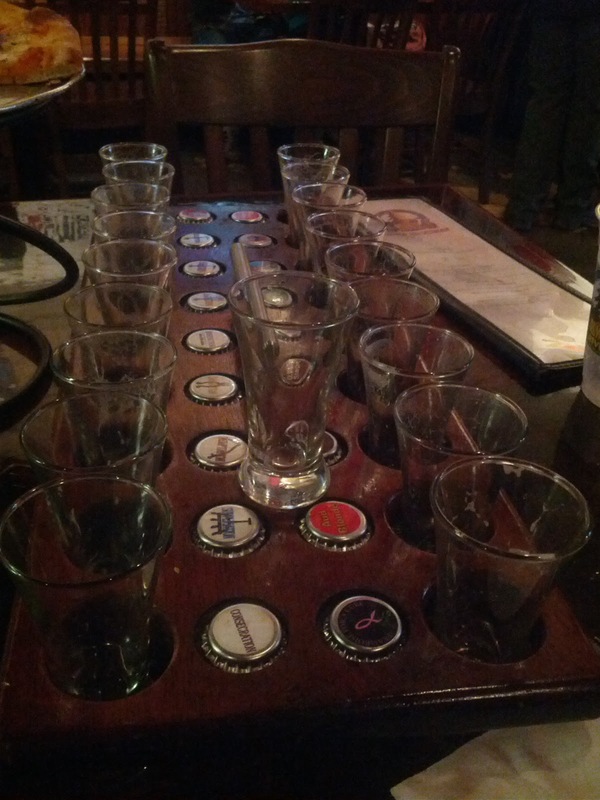 For the most part, a brewery's tasting flight is usually a selection of four or five beers, 4oz each. 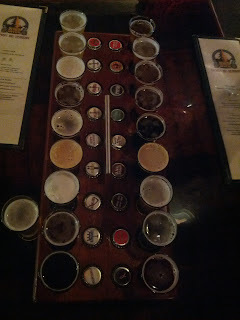 In contrast, the flight at Russian River was a 4oz pour of each of their beers. Each of their 19 beers. When the flight is delivered, the bartender explains how best to proceed: start with the lighter American beers, work through to the Porters and Stouts, move on to the big American hoppy beers, continue onto the Belgian style beers (going light to dark), and finishing with the sours. Pliny the Younger was absent that evening as it is only released in February. However, I did get to try Aud Blonde, O.V.L. Stout, Russian River Porter, Happy Hops, Row2/Hill56, Bling Pig IPA, Pliny the Elder, It Takes A Lot of Great Beer to Make A Great Wine, Redemption, Little White Lie, Perdition, Damnation, Benediction, Sanctification, Temptation, Supplication, Consecration, Brux, and Framboise For A Cure. Great Beer/Great Wine was a phenomenal American Pale Ale. 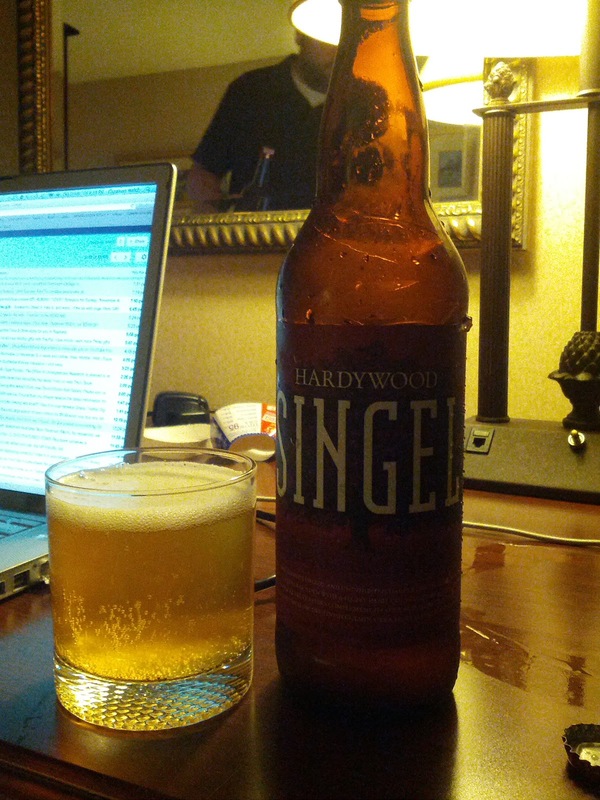 At 4.7%, it had a bit of a pine aroma and tons of citrus flavors. Russian River describes the beer as "a toast to our winemaking friends who work around the clock during harvest to make world-class wine right here in our own back yard." I know I would eagerly reach for this beer while harvesting grapes! Framboise For A Cure (7.5%) is an A+ sour ale, aged in Chardonnay barrels with brettanomyces, lactobacillus and pediococcus with 100 pounds (per barrel) of raspberries added. And how those raspberries shine! Wonderful fruity aromas with a mouth like tart raspberry purée. And 100% of the proceeds are used to aid in the fight against breast cancer! Salvation (9.0%) is a phenomenal Belgian style Strong Dark Ale. Full flavored, fruity, with lots of chocolate (dare I say tootsie roll?) flavor. A warm boozy finish, it stands out as among the best American interpretations of this style. After tasting all 19 beers, I had to conclude my evening with a pint of my two favorites. To accompany my meal, I first ordered Pliny the Elder. At 8%, it is one of the most balanced beers I've ever tasted. No hint of alcohol, just a rounded fruitiness: nothing pokes you in this beer. It absolutely lives up to its reputation. And following that (good thing I wasn't the one driving home! ), I chose to finish my night with Consecration (10%): a massive Sour Dark Ale aged with black currants in Cabernet Sauvignon Barrels for 8 months. Caramel and rich fruits, hints of Cab mingling with flavors of sherry and port, everything is beautifully balanced. It is heaven in the mouth! Five hours later we were ready to head home. Very happy and a tad tipsy, I revelled in the magnificent experience I just had. And I could safely say: Russian River is, in fact, one of the greatest breweries in the world.